I hope with this to take you with me on a little journey back to her time and open a door to her art for you. Personally I knew her name already before I knew there was something called art. My mother loved her work and somehow I picked up her name as a little child. I can’t remember when or why. I grow up in Cologne where we’re happy to have a museum about her and her great, strong work. I’ve been fascinated by her art. I feel deep respect for her work, her sensitivity, her strength. Käthe Kollwitz was born July, 8th 1867 as the fifth child of Carl Schmidt and Katharina Schmidt, née Rupp, in Königsberg which today is Kaliningrad. Her grandfather, Julius Rupp, founded the first “Free Religious Congregation” in Königsberg and became its first minister. After his death, his son-in-law Carl Schmidt took over this office. Käthes father studied law, but had to abandon a legal career as a result of his membership of the “Freie evangelische Gemeinde”. He then trained as a mason and became a successful builder. It’s the father who discovered Käthes drawing skills and it’s the father to whom she owed her training as an artist. In the 1880-ties she received her first instruction in Königsberg from the painter Gustav Naujok and the copperplate engraver Rudolf Mauer. In 1886 Käthe meets the writers Gerhart Hauptmann and Arno Holz on a journey to the Engadine. In Munich she was fascinated by the work of Rubens in the Alte Pinakothek. After this journey she attends the painting class for portrait studies with Karl Stauffer-Bern at the Women’s Academy Berlin for one year. Stauffer-Bern draws her attention to the engraver Max Klinger. At the academy Käthe got to know Beate Bonus-Jeep (1865-1954) and they became very close friends. Beate gave Käthe advice for many works. She later wrote the book “Sixty years of friendship with Käthe Kollwitz” after Käthes death. In 1887 Käthe returned to Königsberg and received instruction from the painter Emil Neide. Käthe met the medical student Karl Kollwitz and became engaged to him. Karl Kollwitz was a member of the Social Democrats and was close to the “Free Congregation”. From 1888-90 Käthe studied at the Women’s Academy Munich with Ludwig Herterich. In 1888 she drew the first pictures involving the problem between the sexes. The drawings to the Gretchen theme, from Goethe’s Faust, are among the earliest works by the artist that tackle the problem of the sexes. Käthe returned to Kïngsberg in 1890. After her return she continued her studies of “Germinal”, Emile Zola‘s novel about miners. To this end she made character studies in pubs frequented by sailors. Her former teacher Rudolf Mauer introduced her to graphic techniques. Käthe married Dr Karl Kollwitz in 1891 and they relocated to Berlin. Karl Kollwitz opened a surgery for patients insured under the public health scheme in the Prenzlauer Berg quarter in what is now the Kollwitzstraße. She received the decisive impulse for her concentration on graphic art and the inspiration of using this technique to portray the more difficult aspects of human life from the theoretical work “Malerei und Zeichnung” by Max Klinger. She planed a cycle of prints on Zola’s novel “Germinal” which she abandons in 1893. Through the close encounter with large city misery in the district Prenzlauer Berg and in the practice of her husband who had been assigned the medical care of tailors and dressmakers, many of whom work at home, Käthe Kollwitz began to be involved with socially critical themes. May 14th 1892 she gave birth to her first son Hans. Hans Kollwitz (1892-1971) became a medical doctor, and he became a school doctor in 1928. Later he was director of the Department of Epidemiology in Berlin. After the Second World War he retired early in order to devote his energies to the service of his mother’s work. He published her diaries and letters in selection, supported exhibitions and edited a volume with photographs of her sculptures. In 1893, under the influence of the première of Gerhart Hauptmann’s drama “The Weavers” based on the famine-induced revolt of Silesian weavers in 1844, Käthe Kollwitz began her first cycle of prints entitled “A Weavers’ Revolt”. In 1897 she successfully finished work on the cycle. February 6th 1896 she gave birth to her second son Peter. Peter Kollwitz (1896-1914) wanted to become a painter. At the outbreak of the First World War he volunteered for service and died in battle near Dixmuiden, Belgium on October, 22nd 1914. In 1898 Käthe Kollwitz succeeded in achieving her breakthrough as an artist with her cycle “A Weavers’ Revolt” at the “Große Berliner Kunstausstellung”. From 1898-1903 Käthe Kollwitz received a teaching appointment at the Women’s Academy Berlin for engraving and drawing. In 1899 she took part in the first exhibition of the “Berlin Secession“. She was a member of the “Berlin Secession” from 1901 to 1913. Inspired by her reading of Wilhelm Zimmermann’s “General history of the great peasants’ revolt” she begins work on the second cycle “Peasants’ War”. In 1904 with the support of Max Lehrs she commissioned to create her planned cycle on the peasants’ revolt as a gift for the “association of historical art”. During a two-month stay in Paris for study purposes Käthe attended the Académie Julian to acquire the fundamentals of sculpture. Her growing interest in sculpture took her to the studios of Auguste Rodin. In 1906 Käthe designed the poster for the “exhibition of the German home industries” in Berlin . The empress refused to visit the exhibition as long as the poster is on public display. The award of the “Villa Romana Prize” donated by Max Klinger made it possible for her to spend several months in Florence in 1907. Accompanied by a friend, she went on a walking tour to Rome lasting three weeks. From 1908 to 1910 she worked freelance for “Simplicissimus”. She dealed directly with the current problems of the proletariat in 14 drawings for the satirical periodical. She increasingly used her drawings as an instrument of social and political commitment. Käthe completed the “Peasants’ War”” cycle in 1908. She started to keep a diary. There are diary entries for the period from September 1908 to May 1943. Käthe began her sculptural work in 1909. She created a portrait in relief of her grandfather Julius Rupp for a memorial stone in Königsberg, which was erected on the occasion of his 100th anniversary of his birth. In 1912 Käthe was elected on to the executive committee of the “Berlin Secession”. Her poster for the “Lobby Greater Berlin” was banned on account of “incitement to class hatred”. She pointed to the poor and overcrowded living conditions in the city. 1913 after the “Berlin Secession” split; Käthe Kollwitz joined the “Free Secession” and was a member of the executive committee from 1914-16. She was co-founder and first president of the Women’s art association. Her sculpture “Lovers” was created between 1913 and 1915. 1914 her son Peter felled as a volunteer in Belgium shortly after the beginning of the First World War on 22 October. As the war progresses Käthe Kollwitz became a pacifist. The artist planed a memorial to her fallen son which does not find definitive expression until 1932 in the memorial “Mourning Parents”. The death of Peter influenced her work. 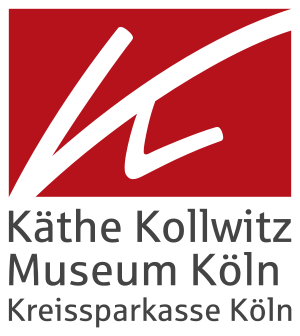 1917 many exhibitions took place on the occasion of Käthe Kollwitz’ 50th birthday. The most important was organised by Paul Cassirer in conjunction with the artist. It was shown in his gallery in Berlin, later in Dresden and Königsberg. 1918 In an open letter published by the newspaper “Vorwärts” on 30 October 1918 Käthe opposed Richard Dehmel’s “Call for a last War Contingent”. She concluded her letter with a quotation from Goethe’s “Wilhelm Meister’s apprenticeship” “Seed for sowing should not be milled”. Her attempt to come to terms with her wartime experiences lead to a series of graphic works on this subject which culminate in the woodcut sequence “War”. Käthe Kollwitz was the first woman to become a member of the Prussian Academy of Arts and was at the same time appointed professor in 1919. At the request of his family Käthe Kollwitz drew the assassinated Karl Liebknecht in the mortuary. 1920: Address at the grave of Max Klinger as the representative of the “Free Secession”. The artist took up cudgels against the post war emergency situation in a poster and in “Leaflets against Profiteering”. Inspired by woodcuts by Ernst Barlach, she created the memorial print for Karl Liebknecht as one of her first works using this technique. Her son Hans married Ottilie Ehlers. Her first grandchild Peter is born 1921. Her grandchildren Jördis and Jutta were born in 1923 and Arne-Andreas in 1934. She participated in the “black and white exhibitions” of the Akademie der Künste in Berlin until 1934. Käthe executed her sequence of prints on war as woodcuts. She designed the poster “Help Russia” as a contribution to dealing with the catastrophic drought in the Volga region. After Théophile-Alexandre Steinlen the International Trade Union Organisation commissioned Käthe Kollwitz to create a poster for the Anti-War Day in September 1924 on the occasion of the 10th anniversary of the outbreak of the First World War. It was entitled “The Survivors – War against war!” and was published in several languages. 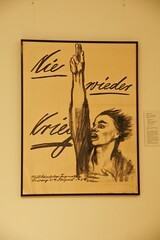 With the poster “Germany’s Children are Starving!” for the IAH Käthe took a stand against suffering caused by inflation. The portfolio of drawings “Farewell And Death” with 8 facsimile drawings by the artist was published with an introduction by Gerhart Hauptmann. In 1924 she created one of her most famous posters entitled “Never Again War” for the Central German Youth Conference of the Socialist Workers Movement. She contributed a lithograph to the “Famine” portfolio for the IAH. In 1925 her mother died. She’d been living at the Kollwitz family flat since 1919. Käthe created the woodcut sequence “Proletariat”. Between 1926 and 1932 Käthe created a sculptural self-portrait. She also travelled to Belgium with her husband and visited the military cemetery in Roggevelde near Dixmuiden where her son Peter was buried. The work on her memorial “The Mourning Parents” was then completed. In 1927 there were numerous honours and exhibitions on the occasion of her 60th birthday. In November Käthe Kollwitz, accompanied by her husband, travelled to Moscow to attend the celebrations of the 10th anniversary of the October Revolution. From 1928-32 Käthe worked as director of the master studio for graphic art at the “Preußische Akademie der Künste” in Berlin. She was awarded the medal “Pour le Mérite” for science and art in 1929. Together with Hans Baluschek Käthe Kollwitz assumed the role of protector for the film “Mutter Krausen’s Fahrt ins Glück” (Mother Krausen’s Trip to Happiness) which was made in honour of Heinrich Zille. And she designed a poster for it. Käthe completed her sculptural masterpiece, the memorial “The Mourning Parents” and exhibited the two plaster figures for the first time at the Berlin Academy exhibition in 1931. 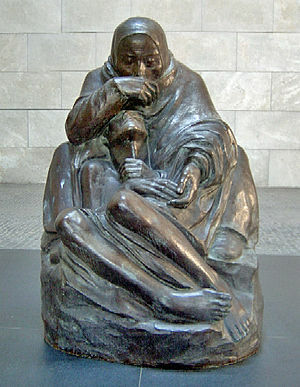 In 1932 the sculptures of the “The Mourning Parents” were executed in Belgian granite by the sculptors August Rhades and Fritz Diederich and exhibited in the foyer of the National Gallery in Berlin. In July Käthe and Karl Kollwitz travelled to Belgium to supervise the erection of the memorial at the military cemetery Roggevelde. Käthe and Karl signed the urgent appeal for the merger of the SPD and the KPD in order to prevent a National Socialist majority in the elections to the Reichstag on 31 July. 1933 after the rise to power of the National Socialists Käthe and Karl Kollwitz and Heinrich Mann still support the urgent appeal for a merger of the leftwing parties on the occasion of the last free elections on March, 5th. Käthe Kollwitz and Heinrich Mann were then forced by the Nationalist Socialists to leave the Preußische Akademie der Künste. 1934 Käthe began to work on her last graphic sequence entitled “Death” which she completes in 1937. She found a new workshop in the communal studio in the Klosterstraße in order to finish her major sculpture “Mother With Two Children”. For her younger fellow-artists she becomes a model of integrity and stamina. 1935 began the unofficial ban on exhibiting her work. In 1935/36 she created the bronze relief “Rest in the Peace of His Hands” for her own family tomb on the central cemetery of Berlin-Friedrichsfelde. An article in the Moscow newspaper Isvestia based on an interview with Käthe Kollwitz lead to her being interrogated by the Gestapo in 1936. She was threatened with imprisonment in a concentration camp if the offence should be repeated. Her exhibits submitted for the Berlin Academy Exhibition were removed one day before the opening of the exhibition. 1937 as all the plans for a public exhibition on her 70th birthday were thwarted in Germany, she presented a selection of her works in her studio in the Klosterstraße. She had the sculpture “Mother with two children”, completed in 1936, executed in shell limestone. She created her sculpture “Pietà” between 1937 and 1938/39. In 1938 she attended the funeral of Ernst Barlach. 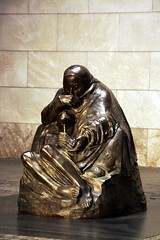 Her mourning was expressed in the bronze relief “Lamentation” completed in 1940. July 19th 1940 Karl Kollwitz died. In the small sculpture “Farewell” (1940/41) Käthe came to terms with the loss of her husband. 1942 her eldest grandson Peter died in action in Russia. Käthe created her last small sculpture “Two Soldiers’ Wives, Waiting” before being evacuated to Nordhausen in 1943. Käthe Kollwitz’ apartment and her son’s house in Berlin were destroyed in air raids. 1944 Käthe Kollwitz accepted an invitation by Prince Henry of Saxony to come to Moritzburg. On April, 22nd 1945, a few days before the end of the war, Käthe Kollwitz died at Moritzburg. In the autumn of the same year the urn containing the artist’s ashes was transferred to Berlin and buried in the family grave at the Central Cemetery in Berlin-Friedrichsfelde.